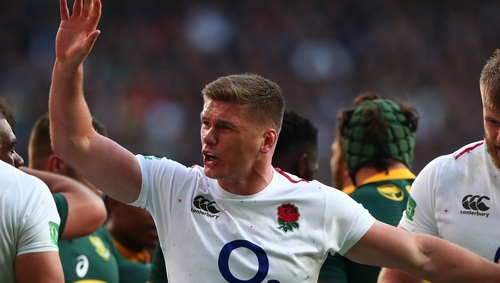 Owen Farrell faces a second anxious wait over his controversial "red zone" tackle that helped England beat South Africa 12-11 on Saturday as he could still be cited despite being cleared by the referee and TMO of not using his arms in a massive hit. England kicked it dead but instead of blowing for time, Australian referee Angus Gardner called for a TMO review, with a potential match-winning penalty in easy range for Springbok outhalf Handre Pollard. After looking at the replay, the officials ruled that Farrell had made enough of an effort to wrap an arm round his opponent to make the tackle legal - leaving the England man punching the air in delight. "As soon as anyone goes to the big screen you are [nervous]," Farrell told reporters. "It was a pretty big collision. He ran hard, it's hard to get your arms around when you're both hitting each other at that much force. I tried to and thankfully it went our way. "I didn't feel lucky, my intent was to wrap my arm. He had a 30-metre run up at me so it was tough, we both popped up off each other and it is difficult to keep that under control." Farrell, who was yellow-carded for a similar hit late in the defeat by Australia that ended England's World Cup hopes in 2015, could still be punished if the citing commissioner deems Saturday's hit worthy of a red card. New Zealander Keith Brown has until 5pm today to make a decision and any ban would rule Farrell out of next week's game against the All Blacks. Former Ireland captain Brian O'Driscoll said the referee got the decision "spot on" while former Australia lock Justin Harrison said "just because you don't wrap doesn't mean it a shoulder charge, when laws of physics mean it's a bounce effect." However, former Ireland back Luke Fitzgerald, who was forced to retire at 28 with a neck injury, said that under the new interpretation of the tackle law it should have been a "minimum of a penalty...shocking adjudicating" while Sunday Times journalist Stephen Jones described the decision as ludicrous. South Africa coach Rassie Erasmus opted to go down the sarcasm route when asked for his opinion. "It was a good tackle, well done, because I haven't seen Andre Esterhuizen being tackled like that in a while," he said. "It's obviously something that's really effective. We should look on it and execute it like that."